Sri Lanka is an island located at the southeastern tip of India between the Indian Ocean and the Bay of Bengal. Colombo is the largest city of Sri Lanka with two million inhabitants, while Sri Lanka has 20 million residents. Colombo’s harbor and position along the East-West sea trade routes enticed the Greeks, Persians, Romans, Arabs and Chinese traders who visited regularly over the centuries. 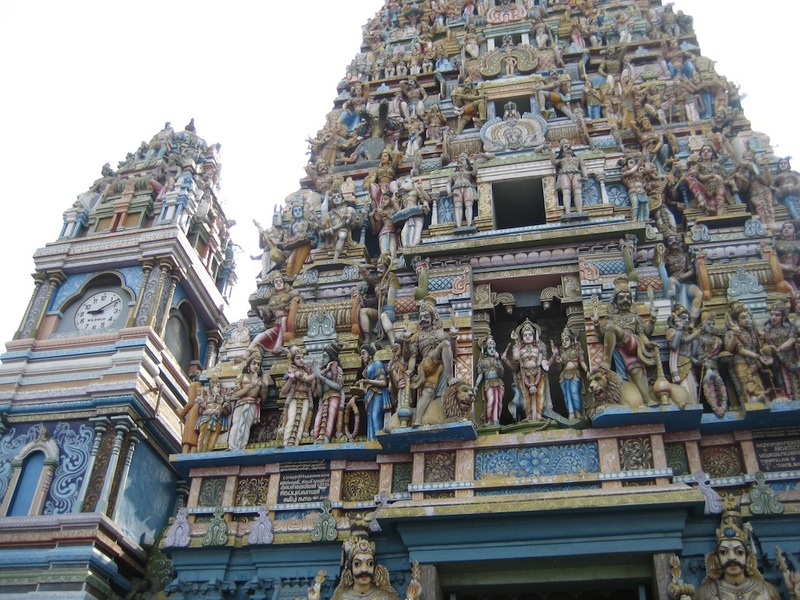 Muslims of various ethnicities began to settle in Colombo around the 8th century, mostly because of this trade business. In the 15th century the Portuguese established a foothold in the area and were granted authority over the coastline in exchange for guarding the coast against invaders. However, they soon expelled the Muslims in Colombo, building a fort there in 1517. The Dutch signed a treaty in 1638 with the King of Kandy, assuring Dutch assistance in the King’s war against the Portuguese in exchange for a monopoly of the trade goods. However, in 1656 the Dutch refused to return control to the King, eventually assuming control of the area’s valuable cinnamon lands. The British captured Colombo in 1796, beginning an era of British colonialism that ended in 1948 when Sri Lanka (then called Ceylon) gained independence from Britain. Modern-day Colombo is a mix of old and new. Colombo has a mile long seafront promenade designed by British Governor Sir Henry Ward in 1859 as a horseracing track. The city’s central park lies along the western shore and is known as Galle Face Green. The fort district is the city’s heart and is filled with old colonial buildings like the Grand Oriental Hotel converted from an 1850’s military barracks and the Presidential Secretariat or former parliament building. Upon our arrival at the pier a large elephant dressed in a colorful blanket greeted us so that everyone could get a photo with it. Also pier side was a group of local dancers and musicians performing local folk dances. As usual a large contingent of vendors had set up shops along the pier selling clothing, jewelry and souvenirs. The temperatures are once again in the 90’s with high humidity so water and sunscreen is essential. 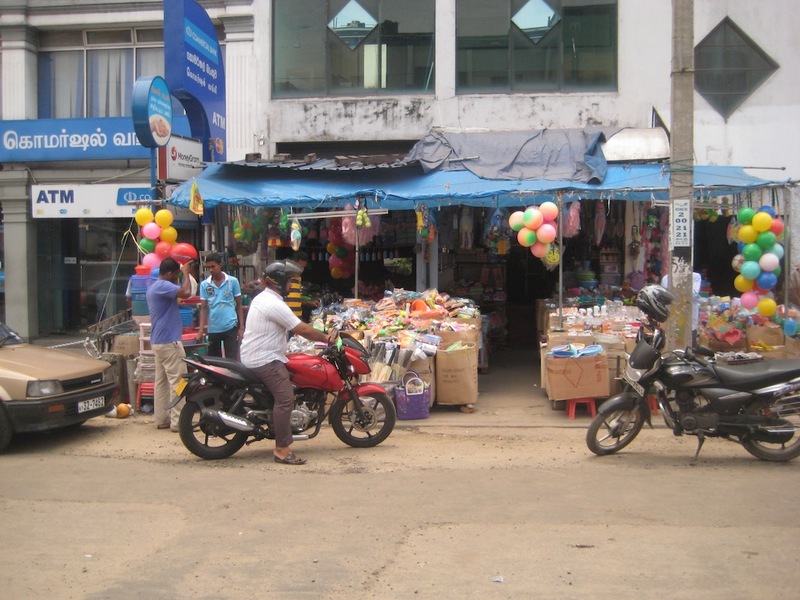 We visited the Pettah neighborhood, which is Colombo’s bazaar district built on a very colorful maze of streets. Each street has a specialty, but you never know what you might find. The street vendors not only have shops but the streets themselves are filled with vendors selling things like a mound of electrical tape, televisions or light fixtures. Here we saw the 100-year-old clock tower built by the British. Within this neighborhood are several buildings built of red and white brick and resembling candy canes. Next, we visited the Colombo National Museum, located in a gorgeous British style white building with arches, columns and verandas. The museum was beautifully laid out with extensive collections of artifacts from prehistoric times until today. We saw things like a collection of coins, a collection of flutes, ivory hair combs, stone implements, jewelry, and animal bones to fishing canoes. Everywhere we seemed to go today we would find snake charmers with small baskets containing cobra snakes and the charmer would be playing a flute. Most of the snake charmers wanted a dollar to take a picture. At the Gangarama Buddhist Temple we discovered an unusual and extensive collection of kitsch–a complete contrast to the normally austere atmosphere of a Buddhist temple. The temple contained several buildings of stuff. You might find a case filled with watches next to a table filled with plates or flower vases. Next to that might be a case with elaborately carved ivory figurines or paintings stacked one upon the next. Everywhere you looked there was stuff that might remind you of your grandmother’s attic or basement. It being a Sunday, there were several hundred children praying in the courtyard around the stupa. 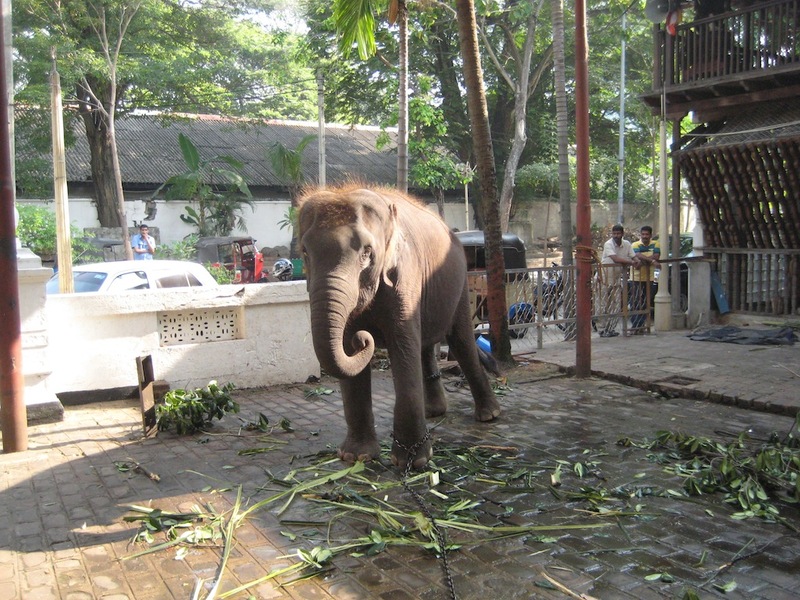 Also on the grounds was a baby elephant. In addition to the Buddhist temple, we also visited a Hindu temple with an extremely ornately decorated exterior. The entire peaked roof is made up of ceramic figurines hand painted in vibrant colors, like an ornate cake. Inside the temple were many smaller shrines where 64 gods are worshipped. One of the small inner temples required that men who entered remove their shirts and to stand in a particular corner of the room. We did not go in! Flowers are often brought to the temple as an offering and none of the temples allow shoes to be worn inside. We visited the historic Galle Face Hotel built in 1864 and located on the Indian Ocean not far from the port. The hotel features a very small lobby area although there are many covered outdoor verandas and patios for one to enjoy a drink or a bite to eat. The hotel is on the beach. Across from the hotel is the Galle Face Green or park with an array of refreshment stands and souvenir shops set up along the beach. In this area, one of our fellow passengers held one of the large snakes by the cobra tamers. She received quite a surprise when the large snake took a dumb on her skirt. Lovely photo opportunity! Another fellow passenger took a tumble on the way to the men’s room. He had a bad nosebleed and couldn’t get up. Another nurse passenger assisted him and he was able to avoid going to the hospital. Several other passengers have had injuries recently. Perhaps due to age or fatigue from the trip? We stopped for a photo of the Bandaranayake Memorial International Conference Hall, a gift to Sri Lanka from the people of China. Here they hold many international meetings as well as local events such as a bridal faire that was taking place on this day. Considering the fact that the country was having a civil war just five years ago, there seems to be an incredible amount of construction going on. New hotels are being built, new sidewalks and roads are being built, and old buildings are being painted and improved. There are crippled and deformed beggars on the streets, but they are not particularly aggressive. The locals are probably mostly poor but they are helpful, kind and welcoming to us. At the sail-away today, I was stopped by a fellow Canadian passenger. She wanted to tell me that I certainly was pleasant looking, but that the tall one (Mark) with me was definitely better looking. “Sorry to tell you”, she said, “but he is!” Ah, the truth hurts! The evening’s entertainment was an electric cello player from Poland by the name of Mariusz. I do not believe that I had ever seen an electric cello before, but the music he created with it was very nice.